This is the second of two posts on the subject, the first post LinkedIn: Social Interaction Design Lessons Learned (not to follow) - 1 or 2 gives the lead-in to this post. Sadly, the new social functionality has broken much of worked well as an ambient social tool. More problematic was LinkedIn did not seem to grasp what it had: so to build on top of very good start, but it seemingly looked at Facebook for inspiration, but Facebook does not seem to be aware of good social interaction design practices. When building social tools for broad audiences (more than 3,000 people) — which open services on the web are — there is a progression of 3 things that must be accounted for in the planning stages: 1) Velocity; 2) Volume; 3) Relevance. As social tools start getting used they go through a progression one of them are these three stages of concern. Velocity of information is how quickly information is added by the community and has turn over on the in the frameworks. Volume is the mass of information that accumulates over time that will force how information is shared, found, and used. Relevance becomes essential when there is large volume and filtering is needed for information flows and for allowing people using the service to have a manageable stream of information that is relevant to their needs. Many social services can go through these three stages in a few short months if they have 50,000 users or more. LinkedIn does not seem to have considered getting to and beyond the first stage in their planning. As LinkedIn has added social features they have created more streams of information in their flow. More streams lead to more velocity of information. This can be good if the basic concepts for understanding monitoring these streams as well as providing methods for moving things out of the flow so they can be acted upon or set into a personal task flow. The one thing that started the frustration with LinkedIn’s shift was the flood of unrelated social items on the homepage. Much of the social content shared is personal ID focused and not group or work focused (even when shared in groups or work related settings - a quick look at activity summaries regularly shows this). 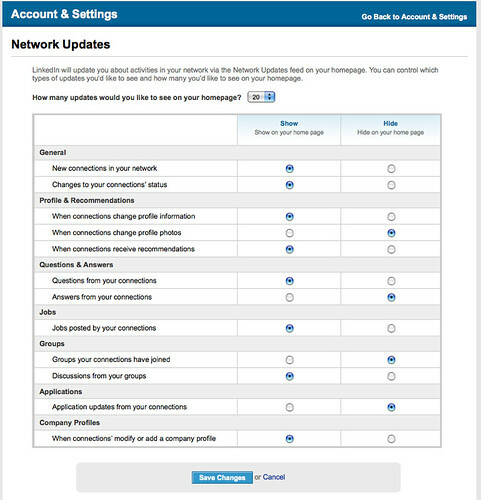 One of the task flows I had with LinkedIn was to accept a connection or get notification of a connection then go to their profile page and download their vCard. The social tsunami that took over the front page of LinkedIn made that task all-but impossible. Part of it is the velocity of information running through the front page for connections increased, velocity the design did not account for. Additionally, the new social components started eating up valuable real estate on that page and had no simple interaction design convention for minimizing, hiding, or turning off that module of functionality from the page. Eventually the ability to turn off notifications to the social tools was added to the Settings page, but there is no notification of that functionality on where the problem exists, the pages where this container shows up (we learned this in software design in the early 90s). Also problematic is the social elements are clustered by task/tool relevance and not person or subject. Including pivots could greatly improve this as well as allow for shifting context by the person using LinkedIn. Focal prioritization is essential to include in initial planning, as this becomes critical when dealing with the relevance stage or even handling a scaling volume of information. Each person using a service is going to have a slightly different set of priorities for relevance and focus. This is going to require some malleability of the system interface to allow for personal optimization of their relevance and streams. This is not emergent behavior but the reality of what happens when systems scale. LinkedIn is built “;like a classic chamber meeting where networking is orchestrated”;, as stated by Margaret Rosas. Sadly, LinkedIn is not built for flexibility that is needed as systems scale to or beyond the volume stage. It is built as if this was a surprise, which prior to 18 months ago LinkedIn’s careful approach was much smoother with their growth of features and functionality. LinkedIn changed its layout and structure of its pages to account for the coming new functionality, which is quite smart. But it did so in a manner that seemed to consider all notifications and functionality should have the same focus. If you remove notifications, there is no ambient notification to let you know there is really any activity. The front page is part portal and part dashboard, but the distinct concepts around these two approaches seem to have baffled the interaction designers and developers. LinkedIn: Social Node or Social Hub? LinkedIn also seems quite schizophrenic as to its social purpose. It has built part of the social framework as if the rest of the web only allowed limited interaction with it, which it would make it just a node on a network. This destination framework does not account for people having any other service that provides social features that could easily be shared in or out. The other side of LinkedIn is a hub, which information flows though. Inbound status messages from other services show up in LinkedIn’s pages as to the “applications”, but using connecting identity in a manner that permits not having Twitter messages I read elsewhere show up in LinkedIn would be more than helpful (yes, part of this is OAuth, which Twitter and many other have not deemed valuable yet (come on Twitter this is not rocket surgery). The applications and information it allows in is limited to a relatively small number of services. Having a small number of services integrated should allow for contextual relevance of the objects, but that would be assuming again LinkedIn was well thought through. This interaction with services would also benefit form LinkedIn offering OpenID as well as OAuth integration to ease the pain and security. LinkedIn does not have an open API as of yet (this should have happened when they launched status and some other social elements). The LinkedIn API for status would allow LinkedIn to be a sharing out hub as well as the partially capable in-bound hub it already is. LinkedIn is a business focussed social environment, but has not realized its DNA is business based and there are task flows and workflows to enable that would make a lot of sense. All social begins with me. Social interaction is about an individuals intentions, actions, and their activities. 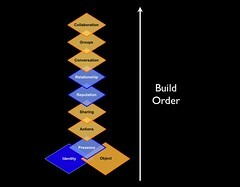 What things a person wants to share with others and how interact with is one part of the social framework. Another other is consumption and working with the flows of content generated by others. LinkedIn did a decent job with flow until it started adding the more social features in the last 18 months. What LinkedIn did know (focus and purpose) they now show little grasp of understanding as their features have created more flow and more velocity for the information ebbing through the service with no planning for it. It takes very little understanding of social tools to know that this will likely happen and there are interaction elements that are going to be required to handle this, for example moving things out of the flow. Many people want to see those they have just connected with, things they just published/shared and responses. There is also the desire to hold on to things that are relevant to the individual. This holding on to things requires a means to favorite or put it in place where things can be collected and worked on later. These things could be single comments in group discussions, people’s names/profiles who are surfacing, notifications, etc. With the velocity of information increasing in LinkedIn the capability to perform a task and drop back into the flow where you were is gone. Any decent interaction designer for social tools knows this reality and had a stack of solutions to set in place from the outset. The math of social software for people is the mostly the one-to-one relationships and being able to see those. But, social software occasionally is about communicating to groups. LinkedIn added group discussions, but did this as if the last 10 to 15 years in forums and groupware platforms never existed. The group discussions are not threaded nor do they offer the option to turn on threading for the discussions (this has been default for off-the-shelf forums for over 8 years at least). Also lacking is the capability to hold on to and collect valuable items found in discussions, let alone a means to personally contextualize them. Another thing LinkedIn fails to grasp is contextual relationships to people in the discussions. For example, if someone I know has started or commented in a group discussion the service should highlight this. There is a potentially higher social contextual relevance for that piece of information. When information starts turning from a stream into a flood this becomes insanely important. Once this reality of contextualizing is realized, there are a couple of options that are likely to be needed quite quickly after. One is adding new people in the discussion that we interact with; this context could be surfaced in the discussion or used to augment the rational surfaced in the recommendations. Email from groups should not be from the organization name of the group as that looks like it is from the organization. I get official information from organizations, but lacking the understanding of contextual information for e-mail makes an even greater mess of e-mail and group interactions when this is lazily designed. The “from” should begin with LinkedIn group or some other notation. When LinkedIn added events, I started getting invitations to attend them. But, the wording of the invites made it sound like they were personal invitations, which is not the context they were intended. It took quite a few rather embarrassing e-mails for many events, if they were really requesting my attendance or if it was just an announcement of the event. Understanding a modicum of social interaction and social etiquette would have saved those embarrassing e-mails. Events also launched with many bugs (many have been ironed out, but most were of the rather blatant variety). One downside of events is there are already an over abundance of event tools, which work rather well (this is a really tough tool set to get right and build). Nearly everybody I talk to has wondered why LinkedIn did not use something like Confabb to license it or buy it (there are many event services available), rather than using their own resources on something that is not up to the level of competing products. Lastly, with regard to events, while the recommendation for connections is good in LinkedIn, the recommendations for events is absolutely horrid. If that is who LinkedIn thinks I am I need a new service now. One of the things that has been flawed in LinkedIn for quite some time is messaging flows. I liked that they pushed messaging out into e-mail and I could respond to a person from my e-mail. One thing that is missing is LinkedIn not updating their messaging flows. Looking in LinkedIn it is quite often impossible to sort out. When I stated I continually have this problem, Jess Leccetti stated, “I’ve had that exact problem! I thought it was my comp being buggy!” Messaging across various media channels is tough and most often fractured. But, when offering a solution it is important to get it right. Finally LinkedIn added the capability to for people using the service to add their own private comments on to other’s profiles. This is a great addition as it allows the means to add context to files. Sadly, it does not seem to surface that information in any other manner other than going to the individual pages. This lack of functionality outside each profile page is really mind blowing, as it leaves out the capability for using it for tagging, contextual grouping, search aggregation, and use these aggregations for sharing up dates or filtering what is shared. There are emergent activities that could evolve out of these functionalities, but again this seems to not be well thought through. One approach is a nice simple personal tagging or labeling interaction layer with clickable aggregation interface option. This would allow simply applying glue to personally thread items together through light aggregation. The current comment system only creates islands of context that have chasms between it and other relevant or related items. LinkedIn needs to get some people in that grasp social interaction design. They purportedly have some, but I am not sure they have influence or the depth of knowledge needed (either is problematic). The LinkedIn service seems to be proof something is horribly wrong along these lines. LinkedIn also seems to be a victim of not sorting-out what it wants to be. If it wants to be a Facebook for business, the route they are taking is not going to work well for the business users as it is greatly lacking solid functionality and cohesive interaction design with task flows enabled. LinkedIn needs to be LinkedIn and not a Facebook for business. As many on Twitter have stated, one seemingly viable option is LinkedIn’s social additions of the last 18 months should all be thrown out and simply start over. The only piece that seems to have much positive feedback is the Q&A section, which is not something that I have interest in, but seems to work passably for others. More coherently, a real reality check is needed at LinkedIn. They must to stop adding features and functionality until they learn to fix what they have added. They need to begin with understanding how social interaction happens, how it scales, and how people need it to work at scale. Stop looking at Facebook for what features to add. LinkedIn has some deep value as a work and business focussed social site, but that is going to require a different focus that what has been applied in the last year to 18 months. I have deep fear that LinkedIn views what is happening is emergent (emergence happens when things are used in an unpredictable manner: whether wholly unpredictable or unpredictable in that context). What is happening in LinkedIn is not emergent. It is quite predictable: This is what happens at scale with social systems and their information flows. A grasp of social systems and their uses at various levels of scale (and potential for various interactions and needs) is really needed at LinkedIn. The slowness to act (or, sadly, react as if this was an unknown potential) and fix what they have is not a great sign of encouragement for the organization. Hopefully having Reid Hoffman back as CEO and with Jeff Wiener as President can pull this into focus and set things on a sane path. Many of the social web services (Facebook, Pownce, MySpace, Twitter, etc.) have messaging services so you can communication with your "friends". Most of the services will only ping you on communication channels outside their website (e-mail, SMS/text messaging, feeds (RSS), etc.) and require the person to go back to the website to see the message, with the exception of Twitter which does this properly. Here is where things are horribly broken. The closed services (except Twitter) will let you know you have a message on their service on your choice of communication channel (e-mail, SMS, or RSS), but not all offer all options. When a message arrives for you in the service the service pings you in the communication channel to let you know you have a message. But, rather than give you the message it points you back to the website to the message (Facebook does provide SMS chunked messages, but not e-mail). This means they are sending a message to a platform that works really well for messaging, just to let you know you have a message, but not deliver that message. This adds extra steps for the people using the service, rather than making a simple streamlined service that truly connects people. Part of this broken interaction is driven by Americans building these services and having desktop-centric and web views and forgetting mobile is not only a viable platform for messaging, but the most widely used platform around the globe. I do not think the iPhone, which have been purchased by the owners and developers of these services, will help as the iPhone is an elite tool, that is not like the messaging experience for the hundreds of millions of mobile users around the globe. Developers not building or considering services for people to use on the devices or application of their choice is rather broken development these days. Google gets it with Google Gears and their mobile efforts as does Yahoo with its Yahoo Mobile services and other cross platform efforts. Broken Interaction Means More Money? I understand the reasoning behind the services adding steps and making the experience painful, it is seen as money in their pockets through pushing ads. The web is a relatively means of tracking and delivering ads, which translates into money. But, inflicting unneeded pain on their customers can not be driven by money. Pain on customers will only push them away and leave them with fewer people to look at the ads. I am not advocating giving up advertising, but moving ads into the other channels or building solutions that deliver the messages to people who want the messages and not just notification they have a message. These services were somewhat annoying, but they have value in the services to keep somebody going back. When Pownce arrived on the scene a month or so ago, it included the broken messaging, but did not include mobile or RSS feeds. Pownce only provides e-mail notifications, but they only point you back to the site. That is about as broken as it gets for a messaging and status service. Pownce is a beautiful interface, with some lightweight sharing options and the ability to build groups, and it has a lightweight desktop applications built on Adobe AIR. The AIR version of Pownce is not robust enough with messaging to be fully useful. Pownce is still relatively early in its development, but they have a lot of fixing of things that are made much harder than they should be for consuming information. They include Microfomats on their pages, where they make sense, but they are missing the step of ease of use for regular people of dropping that content into their related applications (putting a small button on the item with the microformat that converts the content is drastically needed for ease of use). Pownce has some of the checkboxes checked and some good ideas, but the execution of far from there at the moment. They really need to focus on ease of use. If this is done maybe people will comeback and use it. So who does this well? Twitter has been doing this really well and Jaiku does this really well on Nokia Series60 phones (after the first version Series60). Real cross platform and cross channel communication is the wave of right now for those thinking of developing tools with great adoption. The great adoption is viable as this starts solving technology pain points that real people are experiencing and more will be experiencing in the near future. (Providing a solution to refindability is the technology pain point that del.icio.us solved.) The telecoms really need to be paying attention to this as do the players in all messaging services. From work conversations and attendees to the Personal InfoCloud presentation, they are beginning to get the person wants and needs to be in control of their information across devices and services. Twitter is a great bridge between web and mobile messaging. It also has some killer features that add to this ease of use and adoption like favorites, friends only, direct messaging, and feeds. Twitter gets messaging more than any other service at the moment. There are things Twitter needs, such as groups (selective messaging) and an easier means of finding friends, or as they are now appropriately calling it, people to follow. Can we not all catch up to today's messaging needs? Emily Chang posted about "My Data Stream", which brought to mind the idea of personal planets. Emily is pulling together the streaming data from her digital life that passes through feeds. Jeremy Keith has written about his life streams and has had a nice interface to Jeremy's Life Stream for some time now. It was a chat with Jeremy and some others this past summer at the Microlearning conference that I started thinking about playing around with a personal planet, which would use PlanetPlanet, a Python script, to pull all of my life streams together. It works nicely on my laptop, or did until the December crash. But, now it could be time to put it out in public. Why a personal planet? We have an incredible amount of information that passes before out eyes and that is generated by our simple actions. Emily did a great job showing the breadth of feeds generated. This seems a simple thin thread. What if we could quickly scan that thread and annotate it to make it easier to refind. Planets are relatively easy to build and it should be easy to share for others to build upon. Personally, I am really surprised there are not thousands of these out there already. Now to start tinkering a wee bit this week. In the Personal InfoCloud people have various means of keeping information close to them. But, these actions come down to two actions, which are non-exclusive (we can do both). These actions are copying the information to a device or location we are comfortable storing the information and pointing to where the information is located. Copy, Point: What are We Missing? Each action (copy & point) has its own benefits and detractors, but both methods are missing a central component that causes us grief at some point or another. We are missing a tether to that information. In our action of copy & point we are making an explicit action declaring our interest in the item. But, when that item changes we should have the option of finding that out. Sometimes it is a minor inconvenience that the information changed, such as spelling errors have been corrected or a more detailed explanation offered. When the modifications are not minor, we most often would benefit from having notification, such as the price of an object changes, the definition is changed, errors corrected, the date or time of an event changed, new article/post on the subject has been made, etc. We live in a world of ever increasing updates and modifications, mostly because it is so easy to make the modification and we are increasingly becoming an iterative society. Digital information is making providing a platform for this iterative society. In a limited interaction we hit refresh to see the news updates on CNN or ESPN. This iterative society also builds tools to track systems that have a lot of volume and volatility, such as EBay. Information volatility is a given, but when the flood of information we have interest in or have made explicit action statements about is more than we can refresh, how do we cope? How do those developing and designing these information systems make it easier for us? We are tethering to the inflow of information. We subscribe to e-mail for product updates from services like Amazon and we have RSS/ATOM feeds for inflow of news services. These inflow tethers are adding to our information overload. We are finding new tools that allow us to copy & point to the bits that are of interest to us, such as social bookmarking tools like del.icio.us, Shadows, etc., but these tools do not truly tether the information in a manner that is helpful when the information changes. Similarly, when we copy a chunk of information (microcontent) from a report, article, or on-line source we have no means to get an alert when that body of work we copied from was altered. We may be using, or more appropriately reusing the information. We should have an easy means of providing attribution for the item we found of interest (allowing credit where credit is dues is not something that most people are against, but it is not currently easy). There needs to be a solution that would allow easy attribution, in that action we are tethering the information chunk to our source. This attribution mechanism is similar to social bookmarking for larger addressable works (some services like Yahoo's MyWeb 2.0 save a copy of the work we are bookmarking), but neither provides an active tether that alerts us to changes in something we have made an explicit action show our interest in.